These Indoor Snowballs puts a new indoor spin on an old favorite winter time activity. 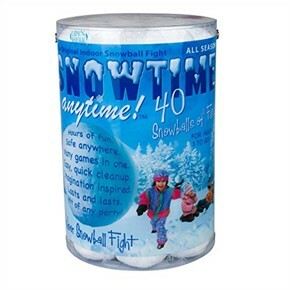 The toy snowballs are designed for players to take part in a good old fashioned snowball fight indoors, without the messy, wet and cold snow the original game has. The snowballs are soft, safe and perfect to use for an indoor snowball fight for children of all ages. Get the whole family involved with this original fake snowball toy! A great way to get kids active or even fun to bring into the office and play around with your coworkers. The snowballs are machine washable and super soft so noone gets hurt. They're even crunchy just like real snow. Includes: 40 snowballs and a carrying case along with a list of the most popular games. You can finally have the best of winter fun without getting cold! Availability: This 40 pack of Indoor Snowballs with display take approximately 1 business day to leave the warehouse.